You wouldn't usually think of heading west to cool off during the summer months but down by the Bremer River in Ipswich you'll find the perfect place. Bob Gamble Park, stage two of River Heart Parklands, provides a winning combination of open green space, elevated views, modern facilities, and amazing kids playgrounds, including a water park. It's a great spot for family fun and relaxation, and best of all it's free. The main attraction for kids at Bob Gamble Park is the water play area. 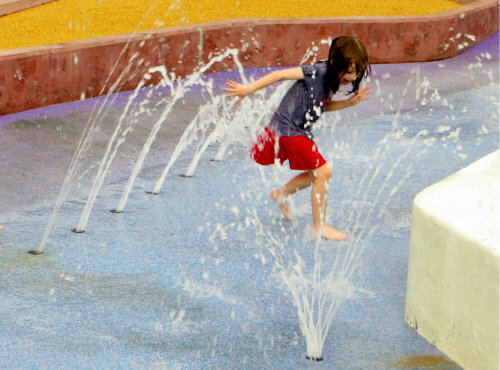 This aquativity zone features a zero depth water pool where children can splash about through the water fountains that unexpectedly squirt water in all directions. Next to this area kids will be able to navigate the stepping stone like structures interspersed with a network of streaming water. 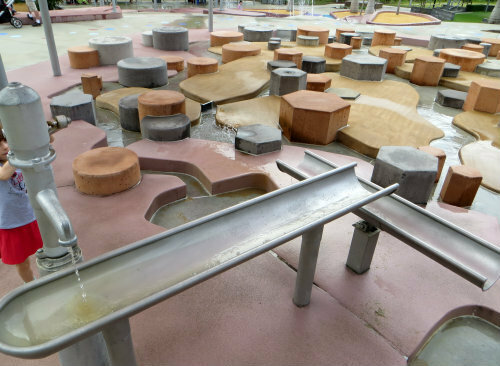 Interactive water pumps, troughs and wheels will allow kids to do some of their own scientific investigation of the properties of water disguised as fun. 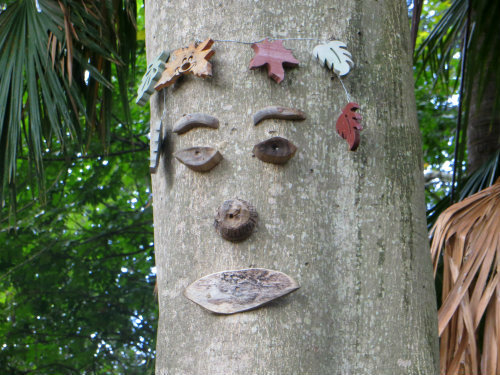 The discovery forest section provides hours of adventure in a lush, shady setting. The showcase of this area is the brightly coloured tree houses. 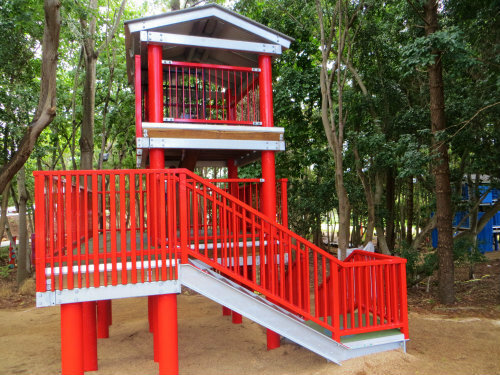 Kids can climb three storeys of fun and feel as though they are in the forest canopy in the rooftop area. Imagine this as a great place for budding pirates to sail their ships, princesses to rule from their castles, and explorers to settle in jungle book style accommodation. 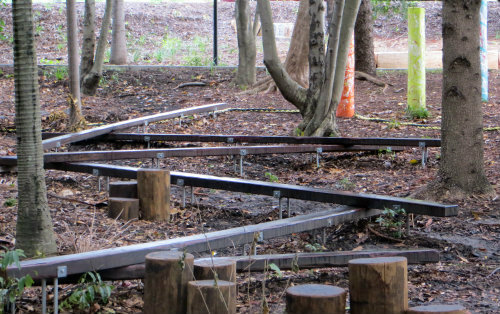 Follow the maze of balance beams, bridges, tree roots or heavy duty rope to navigate your way through some inspiring public art. 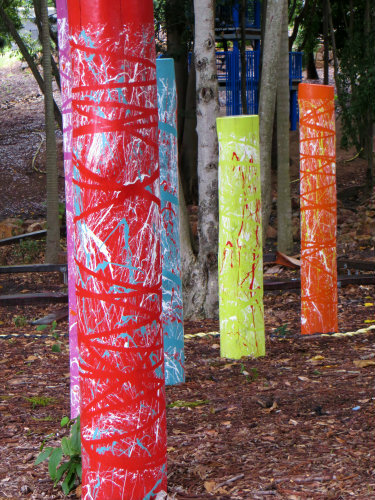 What will these colourful poles be today? 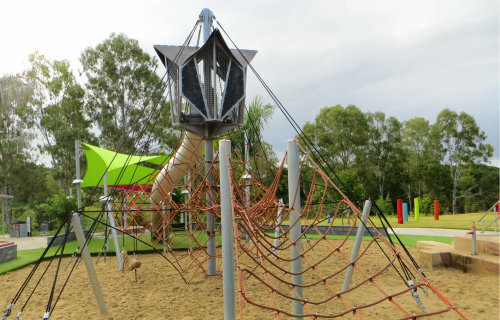 Sandpit areas, swings, a flying fox, giant climbing net and tunnel slide will keep active kids entertained for hours. The best part is that parents can supervise and relax by taking advantage of the seating and grassed areas throughout the park. The river boardwalk is not only beautiful but also educational. This is the link across the entire Parklands. The afternoon views of the Bremer River on the day of our visit were simply stunning – rain had stirred things up yet the water was glassy and still. Information boards placed along the path gave plenty of insight into the past, present and future of this iconic Ipswich landmark. Perfect for strollers, wheelchairs, bikes and scooters, with seats provided at the lookout area. Being a relatively new park the facilities are clean and modern. Toilets and showers came in very handy to wash off sandy children before getting in the car to make the long journey home. Tables, chairs and benches are protected by brightly coloured sun shades. Electric barbeques are available to visitors, although they are popular on weekends and school holidays during the warmer months. [ADVERT]Car parking is available at either end of River Heart Parklands, although the best parking area for Bob Gamble Park is street parking along King Edward Parade. There is even incentive to stay into the night as the river creatures Ippy, Limey and Stoney make their twilight appearance on the river, courtesy of laser projections. 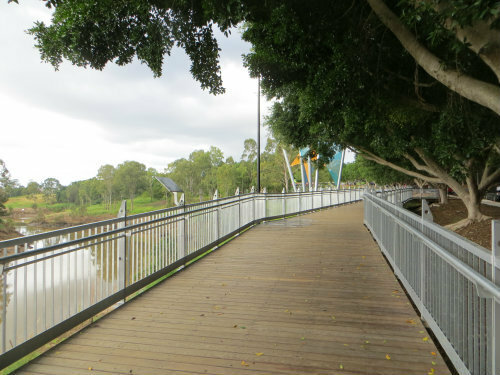 There is so much to explore in River Heart Parklands but the Bob Gamble Park section is a great place for families to start their Bremer River discovery. Why not pack a picnic or barbeque lunch next time you're out in the Ipswich area. Don't forget to pack the hats, sunscreen, togs and towels to take advantage of the newest water park in the greater Brisbane region with stunning water views to add.